A hi-tech drone buzzed above Broncos players at Red Hill, capturing the team’s set plays. 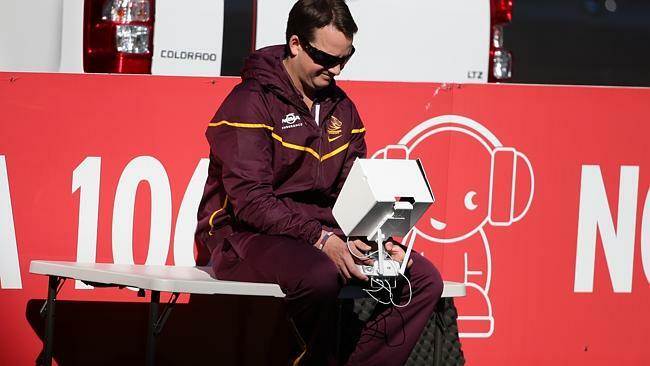 The aerial view of the drone’s camera allows Brisbane’s coaching staff to pinpoint faults in their shape and better direct players to where they should be positioned. It is primarily the initiative of Brisbane’s performance analyst Scott Barker who introduced the drones to Kangaroos training in preparation for the Kiwis earlier this year. The drone, technically known as a remotely piloted aircraft (RPA), is the latest evolution of coaching as teams seek every one per cent advantage possible. The drone has essentially replaced the scaffolding that football staff used to climb every day to position cameras. The drone weighs between 2kg to 11kg, depending on size, and is fitted with a digital camera. It can run for between 15 to 20 minutes before it is brought back to earth for a battery change. “This RPA gives us great footage. We can show the guys positional stuff on the field, the lines they are running, their spacing, where we want to set up plays in certain field positions,” Barker said earlier this year. The Broncos Origin stars were named to return this week against the Wests Tigers with Justin Hodges, Sam Thaiday and Corey Parker playing together for the first time since round 10. That round 10 game was against the second placed North Queensland Cowboys on May 15. The Broncos have won all six games since despite having at least one of their big three unavailable for each match. It will be 65 days, more than nine weeks, since the big three have played together. The inclusion of Hodges sees winger Daniel Vidot drop out of the side.